Shelf Inflicted: Madness, I Say! In this informative, timely and often harrowing study, Elaine Showalter demonstrates how cultural ideas about 'proper' feminine behaviour have shaped the definition and treatment of female insanity for 150 years, and given mental disorder in women specifically sexual connotations. Along with vivid portraits of the men who dominated psychiatry, and descriptions of the therapeutic practices that were used to bring women 'to their senses', she draws on diaries and narratives by inmates, and fiction from Mary Wollstonecraft to Doris Lessing, to supply a cultural perspective usually missing from studies of mental illness. 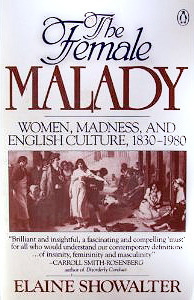 Elaine Showalter’s The Female Malady: Women, Madness and English Culture 1830-1980 is a very informative, very accessible, and very disturbing look at how “insanity” was treated from 1830 to 1980. It examines cultural expectations about how women should behave and how these male perceptions affected the diagnosis and treatment of women’s mental health problems. I read this book from cover to cover and would have been very happy if it were a school text. One of the things I liked most about the book was its personal approach, using the perspectives of female "inmates" themselves, and fiction excerpts from a variety of authors, such as Charlotte Perkins Gilman, Sylvia Plath, Charlotte Bronte, Doris Lessing, and others to highlight women's mental health issues and experiences with doctors and provide an insight into the culture and period. There was also a section on men who suffered "shell shock" during WWI, the treatment they received, the similarities between "hysterical" men and women, and the modernization of psychiatry. I highly recommend this book for those interested in mental health, history, and the effects of power and gender imbalance in the mental health care profession and in society.